Not so long ago, they were eating budget meals, working alone, and cold calling potential clients. 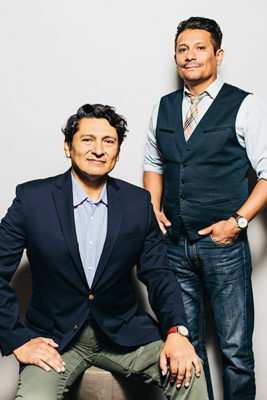 Now, Ozzie Godinez and Pablo Acosta are landing major accounts and winning industry awards. Clients like Discover, ComEd, and the Chicago Bears are choosing the fast growing, minority-owned PACO Collective over powerhouse agencies because its cofounders have built a team that leverages diverse backgrounds and unique insights to stay relevant in today’s minority majority market. Godinez and Acosta share with Hispanic Executive what drives them, how judo and marketing overlap, and the secret to leading a team without sacrificing friendship. Why are you passionate about advertising? Ozzie Godinez: The whole process is endlessly fascinating. As marketers, we try to develop one idea that transcends culture and resonates with everyone. And we’re doing that as the identity of the US is changing. It’s an ongoing challenge, and a puzzle that drives me forward every day. Pablo Acosta: I always wanted to be a storyteller, and advertising gave me the outlet to do that. We tell 30-second stories. People naturally have their walls up when they view an ad, but if I can make an emotional connection, I can potentially crash those walls down. I love trying to do that. What one ad sticks with you always? OG: Oh, no question. The original Coke commercial. I’d like to buy the world a Coke. PA: From the Mad Men finale. OG: Right. It was just so far ahead of its time. They made their message universal and really tapped into something. The song was a hit, the ad landed at just the right time, and they had this special convergence of all the right ingredients. Those big wins are great, but what keeps you inspired every day? OG: For me, it’s PACO thriving. I work for everyone here. That outlook is important for leaders. But is there music, or an ad, or some piece of art that informs your process? OG: I listen to a ton of house music when I write. PA: When we were a two-man shop, I’d send Ozzie emails at 2:00 a.m. and be surprised when he responded right away. That was normal then, to thrive on the energy and the adrenaline from building something from the ground up. Now, we’re more established and the routine has changed a bit, but my family inspires me to do what I do. And music. I love classical music, and I’m learning tango dancing. And I do judo. How do those pursuits help you? PA: There’s a connection there. Judo and tango just shape your mind in a certain way. There’s discipline. It helps the creative process immensely. You guys started this thing more than a decade ago, and you’re still friends. How do you make that work? OG: We’ve become brothers through this process. We can say anything to each other, good or bad. We’ve built that trust and respect. PA: And we know that we could never do alone what we’ve done together. We have to remind ourselves of that. This works because of both of us . . . and now, because of our whole team. What advice do you have about going into business with a friend? OG: Make sure you know your roles. If you each have the exact same role, it’s not going to work. PA: Be prepared for reality. It’s going to be hard sometimes. Many times. You’re not going to see money for a while. We didn’t make real money here for five years because we kept hiring other people and pouring money back into PACO. The people we hired were making more money than us. Go slow. Trust what you’re doing. Remember why you started. OG: And don’t blow all the money as soon as you land one big account.